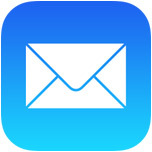 One of the Mac Mail apps many talents is the ability to automatically detect when a flight number is present in an email, and then give you the option to view the flights status by using the flight tracking Dashboard widget in OS X. Yes seriously, the Mac eMail app can track flights! This doesn’t even require a plug-in, it’s all built into Mail for Mac, which passes the appropriate data onto the Flight Tracker tool to then gather more details and display the flight on a map. How nice is that? This is a great way to get information on flights if you’re waiting to pick someone up from the airport, or even if you’re just curious about when a flight will arrive in a given city or airport. 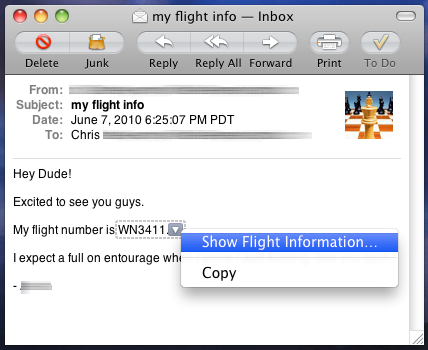 Whether tracking your own flight details by sending yourself an email with some data, or using the OS X data-detectors to grab the flight number from an official flight check-in email from an airline, all Mac users can use this immediately. You can also use the same type of mouse-hovering data detection trick to track shipments and packages in OS X and iOS too. The same can be done by typing the flight into the Notes IOS app. But I can’t seem to get it to work on the Mac Notes.